Hunter Renfroe was named SEC Player of the Week. Hunter Renfroe (BT '11-'12) is up to his old tricks again. 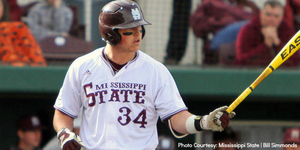 Renfroe homered in each game this week for Mississippi State as they swept Texas A&M. He went 8 for 14 in the series and picked up a double and walk to go along with his three home runs. Over the three games, he came across the plate seven times and drove in four runs. His incredible play earned him the SEC Player of the Week. At Florida Atlantic, Big Train players helped the Owls take three of their four games this week. At the plate, Mitch Morales (BT '12) and Ricky Santiago (BT '13) paced the Owls. Santiago went 6 for 14 with two walks and a double while Morales went 6 for 15 with a walk. They combined to score six times and drive in four. On the mound, Bo Logan (BT '12-'13) pitched 3.1 innings and gave up just three hits and no walks or runs while striking out four batters and earning a win. In relief, Hugh Adams (BT '06-'12) pitched two innings and earned yet another save for the Owls as he gave up just two hits and no walks or runs and struck out three. Two other interesting stories: Jimmy Reed (BT '10) threw 112 pitches for Maryland over nine innings against Miami (FL) last Friday night. Though he did not give up a run, the game went into extras with no runs on the board and the Terrapins lost in extra innings. Reed gave up just three hits and three walks while striking out ten batters. At UNC-Wilmington, Michael Bass (BT '11-'12) had another great week (7/18, BB, HBP, 3R, RBI, SB), but that is more of the same. The story is that his on-base streak is now up to 34 games. Other notable pitching performances: Ryan Doran (BT '12 / San Diego State) - 8.1IP, W, 0ER, 8H, 2BB, 9K... Michael Frank (BT '11 / Bowling Green) - 8IP, W, ER, 7H, BB, HBP, 2K... Michael Judge (BT '13 / Methodist (NC)) - 7IP, W, 2ER, 5H, 0BB, HBP, K)... Ricky Holden (BT '12 / UNC-Wilmington) - 4.1IP, W, 0ER, 2H, 0BB, 2K. Other notable hitting performances: Josh Leemhuis (BT '11 / George Mason) - 10/19, 3R, 10RBI, 3 2B... Brandon Gum (BT '12 / George Mason) - 4/11, BB, RBI... Adam Barry (BT '11-'12 / High Point) - 4/16, 3R, 4RBI, HR.